Britain wants to pick up the pace. EU negotiators in Brussels are taking their time. Blackmail and sabotage, cry Westminster’s Brexiters. The explanation is more prosaic. The more urgent a deal begins to seem for Britain, the higher the incentives stack in favour of a stalling strategy from the EU27. This, of course, is how the process was designed. Article 50 of the union’s treaty was written to discourage nations from leaving. As soon as Theresa May set the article’s two-year clock ticking in March, she conceded the advantage to those sitting on the other side of the table. The prime minister was warned of the danger by her advisers. But that was before she had lost an election and Britain had to confront the hard reality that it cannot have its cake and eat it. The problem for Mrs May is that the structural asymmetry written into the treaty — the cost of a no-deal, cliff-edge exit is much higher for the departing nation than for the rest — is being reinforced by the particular circumstances of Brexit. With the exception of Ireland, even those EU governments hopeful of strong post-Brexit ties see a useful purpose in spinning out the talks. After all, it may still be possible, they can speculate, that the dire prospect of crashing out of the bloc might yet persuade the British to think again. More obviously, there is little to be gained by the EU side in striking an early deal with a government that is still negotiating with itself over what sort of Brexit it actually wants. The television cameras may be focused on the bargaining in Brussels, but most of the big arguments are still happening in London. Mrs May has edged towards realism by accepting the need for a post-Brexit transition period which would not look much different from the status quo — except that Britain would be demoted from the role of rulemaker to that of rule-taker. She is still some distance, however, from owning up to the eventual loss of access to Europe’s markets. Britain cannot simply swap membership of the single market and customs union for bilateral arrangements that provide business with the same advantages. In the circumstances, it makes perfect sense for Michel Barnier, the EU’s chief negotiator, and his team to allow the pressure of time to build up before agreeing to move on from discussions about past financial obligations and the rights of EU citizens to talking in detail about the shape of the future relationship. Politics pulls in the same direction. Mrs May’s ill-fated election gambit robbed the prime minister of her personal authority and her government of its majority. There is no guarantee that she could actually deliver anything agreed in Brussels. The incentive is to let the clock do its work. How long now before an anxious business community takes irrevocable decisions to shift some shipping operations from Britain to the continent? Mrs May thinks she has an answer. The logjam can be broken by direct talks with other governments. More specifically, once the German elections are over on September 24 a re-elected Angela Merkel can be prevailed upon to give a helpful nudge to Mr Barnier to pick up speed. We have been here before. Misreading Bonn and later Berlin has been one of the more reliable threads of 44 years of British EU membership. Germany, the thinking in London goes, is an outward-looking, Atlanticist nation with, by continental standards, a liberal economic bent not far removed from that of Britain. The UK is one of German industry’s richest markets. These are two nations on the same side. Mrs May’s predecessor and author of the present debacle David Cameron made precisely this calculation when he sought before the Brexit referendum to win over Ms Merkel to British demands for EU reform. The chancellor held firm in defence of the integrity of the existing framework of rules. Now Mrs May seems intent on repeating the mistake by expecting Ms Merkel to bend the EU’s rules to accommodate Britain’s departure. But Germany has its own politics and interests. The opinion polls may be unanimous in predicting a fourth term for the chancellor, but they are far less clear about how she will assemble a governing coalition. For the next couple of months securing her own position will come far ahead of bailing on the British. As for European policy, the first priority for Berlin is to assure the stability of the 27. The terms of another bailout for Greece, deepening integration in the eurozone and measures to strengthen the borders of Schengen all rank above Brexit on Germany’s European agenda. To borrow an unfortunate phrase, Ms Merkel’s message to Mrs May is that Brexit means Brexit: Britain cannot leave the EU and expect to escape the consequences. For Germany, the integrity of the union depends on preserving the rules. Those who step outside cannot keep the benefits. Ms Merkel does want a good relationship with the UK. But Germany has the Europe it wants. It is not about to give it up for Mrs May. 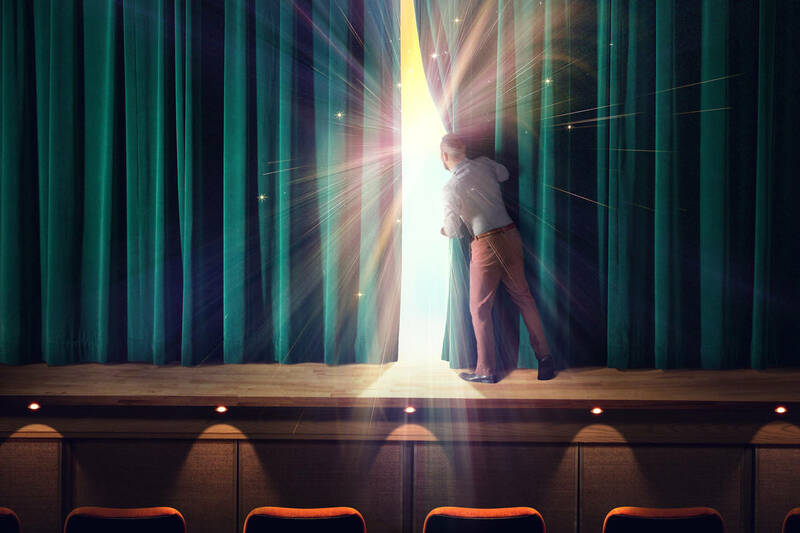 With fewer stocks rising on upside earnings surprises, it pays to look for those that still win applause. Five companies that deliver. Until recently, companies that beat quarterly earnings estimates could routinely expect their shares to rise, sometimes dramatically. Not anymore. This year so far, many earnings overachievers have seen small price gains, or even declines. It’s unclear why. One theory is that buyers’ fatigue is setting in more than eight years into the second-longest bull market in U.S. history. Another is simply that the low-expectations game, whereby companies and analysts have for years crafted easy-to-beat forecasts for earnings and revenues, then surpassed them with great fanfare—but not always much surprise—is losing its punch. Whatever the reason, investors should watch how shares respond to quarterly reports as closely as they watch the financial results themselves. Research suggests the combination of better-than-predicted earnings and revenue, followed by a quick, positive price reaction, tends to predict market-beating performance for months to come. Although there’s a shortage of such true upside surprisers, we’ve found some, including Caterpillar (ticker: CAT) and Analog DevicesADI in Your Value Your Change Short position (ADI). Whether or not earnings surprises have been genuine, growth appears healthy. Earnings per share grew 10% in the latest quarter over a year ago, helped by the energy sector’s rebound from a low base. Although that’s a bit below the first quarter’s growth rate, the trend confirms a return to reasonable profit expansion following a two-year stall. That is important if companies are to grow into their share prices, never mind enjoy further stock-price gains. The Standard & Poor’s 500 index recently traded at 20 times the past four quarters’ earnings, versus a historical average of closer to 15 times. Even more encouraging has been the improvement in earnings quality. The divide between the earnings companies are legally required to report, warts and all, and the prettied-up version they prefer to highlight is gently shrinking, suggesting there is less excuse-making and more genuine growth. So where’s the applause? Nearly three-quarters of companies beat earnings estimates in their latest quarterly reports. While the S&P 500 is up a toast-worthy 11% on the year, fewer than half its components have seen any price increase on the trading day following their latest quarterly report, and fewer than a third have recorded a gain of 1% or more. Overall, investors have grown less impressed with upside surprises, even though their number is as high as ever. Researchers documented as far back as 1968 that companies beating earnings estimates tend to outperform the market for months afterward, a phenomenon called post-earnings-announcement drift, or PEAD. As companies have gotten better at guiding toward beatable numbers, and as analysts have gotten better at playing along, the magnitude of PEAD seems to have diminished. But there are several ways to bolster it. One is to look for companies that surprise to the upside on revenue as well as earnings. Past research by Joshua Livnat of New York University and Narasimhan Jegadeesh of Emory University has shown that companies surpassing both revenue and earnings estimates tend to outperform the market over time by more than companies beating on earnings alone. Perhaps that’s because revenue is more difficult to massage. 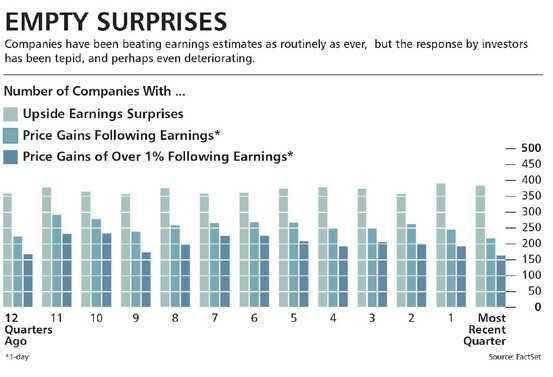 Another way to sort for real, as opposed to engineered, earnings surprises is suggested by a study published in 2012 in the Financial Analysts Journal. 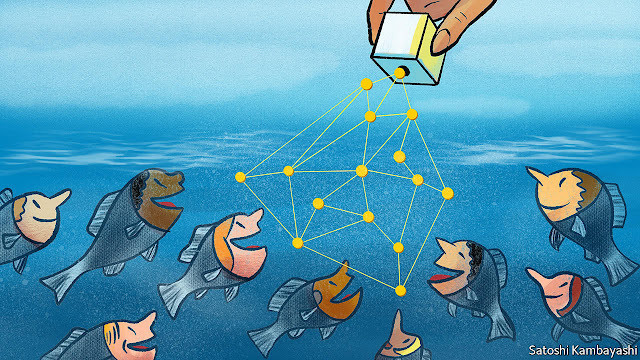 It found that a strategy of buying stocks with upside earnings surprises and quick share-price jumps, and shorting the reverse, tended to return a handsome 15% a year. GUIDED BY THESE STUDIES, Barron’s recently screened for S&P 500 companies that topped both earnings and revenue estimates by at least 1% in each of the past three quarters, and experienced a one-day price increase of at least 1% after reporting results. Some 194 companies qualified on earnings beats alone, and 48 did so on both earnings and revenue beats. 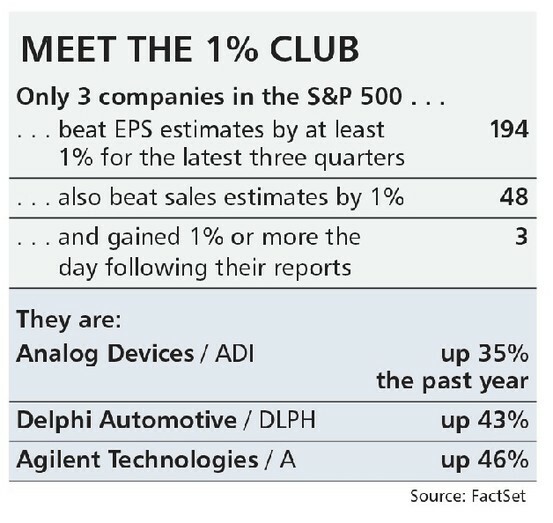 But a mere three—Analog Devices, Delphi Automotive (DLPH), and Agilent Technologies (A)—made the cut on all criteria. To expand the list with a focus on more recent momentum, we then screened for companies that surpassed earnings and revenue estimates by at least 3% in the most recent quarter and saw a price jump of at least 5% in response. Stock screens reduce a vast universe of choices to a manageable few for further consideration, but they don’t quite spit out a Buy list. Our screen turned up 13 names; we chose five that look particularly promising based on growth opportunities. This list includes Caterpillar, Analog, Align Technology (ALGN), E*Trade Financial (ETFC), and Red Hat (RHT), a seller of open-source software solutions. ALIGN TECHNOLOGY has tripled in price in the past two years, outrunning FacebookFB in Your Value Your Change Short position (FB), Amazon.comAMZN in Your Value Your Change Short position (AMZN), and NetflixNFLX in Your Value Your Change Short position (NFLX). Align is in the crooked-teeth business, not the dot-com business, except to the extent that its digital services are accelerating demand for its Invisalign orthodontic trays. A new system doesn’t require goop and dental-mold setting, just a three-dimensional mouth scan, with measurements zipped to the factory. Treatment is faster than braces. Wall Street found plenty to like in Align’s latest quarterly report, including a surge in North American treatments, especially among teens. That’s important, because teens make up an estimated 75% of the teeth-straightening market, and Align has only a 5% share so far. The shares, at $185, fetch 48 times forward earnings estimates, but earnings could double in three to four years, as those digital tools continue to lure more Invisalign patients. CHIP MAKER Analog Devices makes some innards for Apple’s APL in Your Value Your Change Short position (AAPL) iPhone and other gadgets, but two-thirds of its business is tied to industrial and automotive applications. There, silicon is proliferating to enable smart everything, from factory machines that can tell when they’re ready for maintenance, to cars that brake automatically. The dollar amount of semiconductor content in cars is expected to triple in a decade. Barron’s recommended Analog Devices stock in May. It has returned 6% since then, a smidgen more than the market, and still looks inexpensive at a recent $82.34, or 17 times forward earnings estimates. In the latest quarter, investors liked that results from Analog’s car segment were better than expected, even as vehicle sales have slipped. CATERPILLAR IS ENJOYING a sudden sales- growth spurt after a four-year slump. Barron’s turned bullish on the stock two years ago at $77, and doubled down in an April 2017 cover story with the shares at $102. The stock was recently at $120, or 18 times next year’s projected earnings of $6.56 a share. A week ago, management, including new CEO Jim Umpleby, held Caterpillar’s first investor day in three years. He laid out a long-term plan to get to $55 billion in yearly revenue, with 14% to 17% operating profit margins. This year’s forecast puts revenue at $43 billion and margins at 10.9%. BMO Capital Markets analyst Joel Tiss calculates that Cat’s new targets imply $9 to $11 in earnings per share. In the latest quarter, the company not only trounced estimates and raised its full-year forecasts, but said its backlog of new business swelled 25% from a year ago. E*TRADE FINANCIAL is benefiting from a surging stock market, which is boosting assets, trading volume, and margin balances. The company has topped Wall Street’s earnings estimates by more than 20%, on average, for the past eight quarters. Yet the stock recently traded at a 22% discount to Charles SchwabSCHW in Your Value Your Change Short position (SCHW) and a 24% discount to TD Ameritrade Holding AMTD in Your Value Your Change Short position (AMTD), based on forward earnings estimates. E*Trade’s market value is half that of Ameritrade and less than a quarter of Schwab’s. That suggests the company could become a takeover target, especially because the online brokerage industry is crowded, putting pressure on fees. Deutsche Bank analyst Brian Bedell estimates E*Trade could be bought out at anywhere from 8% to 40% above its recent stock price of $40.72. RED HAT HAS RETURNED 47% since Barron’s recommended the stock in May 2016. The company’s core business is selling access to Linux, an open-source computer operating system available to casual users for free. Red Hat Enterprise Linux is a carefully curated, serviced, and secured version of the software favored by banks, hospitals, and other businesses for which reliability is key. The company also makes Red Hat OpenStack, for moving local computer networks into the cloud, and Red Hat OpenShift, which helps programmers write software to run in a variety of settings, including cloud platforms from Amazon and MicrosoftMSFT in Your Value Your Change Short position (MSFT). Red Hat posted upside surprises and raised its guidance in the quarter just passed, and investors might have been particularly cheered by results in newer business lines. Although the company doesn’t break out OpenShift revenue, analysts say it has been more than doubling year on year from a low base. At $108, shares sell for 37 times forward earnings estimates, but a less-expensive 22 times free cash flow. The Chinese government is implementing more restrictions on property transactions in an attempt to limit the surge in prices in major cities. New regulations require larger down payments for real estate purchases, and they, along with other measures, appear to be having some success. Prices in several large cities have begun to stabilize and even decline slightly. But there are signs that getting people to play by the new rules will be harder than the Chinese government anticipated, and this reveals the rift in economic and political interests within China. Banks have begun encouraging borrowers to skirt the new regulations by taking out a second loan to cover the down payment – and then lying about where the funds came from. Banks have encouraged borrowers to deposit the initial loans into their checking accounts in a separate bank. With both loans, buyers can reduce their effective down payment, which is now supposed to be higher, to 0 percent. In theory, banks are required to check the source of funds used for a down payment, but in practice this doesn’t always happen. Banks aren’t the only entities making these clandestine down payment loans. Real estate developers have begun offering two-year, no-interest loans to buyers as an incentive to purchase their properties. They encourage buyers to use the loans to secure a mortgage and purchase property. Then, when the transaction is complete and the buyers take possession, they secure a home equity line of credit – effectively a second mortgage – to pay off the down payment loan. Buyers can essentially purchase property without investing any of their own money. But this is also a risky move for developers: When they fund construction projects with high levels of debt, even slight price decreases could threaten the viability of their company. They must offload their existing inventory or face bankruptcy. Though the government needs to gain greater control over the economy, including the real estate market and its peripheral industries, investors are desperate for opportunities to acquire hard assets. Part of the thirst for real estate is cultural – families often insist that a couple own a piece of property before getting married – but it’s also the result of a lack of viable investment alternatives. Chinese investors tend to be more conservative, reflected in their high savings rate relative to investors in other countries. This is as true for individual investors as corporate investors; many non-real estate companies are purchasing properties because they see property as a secure investment. The Chinese government has, in turn, implemented regulations specifically targeting corporations that invest a lot of money in noncore activities – mainly real estate – both domestically and abroad. Another factor is underlying this trend: the fear of wealth confiscation. The disparity in incomes between China’s coastal provinces and its interior is becoming increasingly evident. Considering that the communist revolution was made possible through the support of peasants in the interior, dissatisfaction in this area of the country could pose a serious threat to the government. It must therefore find ways to encourage growth in the interior or redistribute wealth to the benefit of this region of the country. Redistribution can be carried out in subtle ways. For example, the government could print more money to fund infrastructure and social programs in the interior. This could cause a spike in inflation and therefore decrease the value of people’s savings. This would effectively be a form of redistribution. Investing in real estate is one way for individuals to protect their wealth from this type of government intervention. If inflation rises, yuan-denominated savings decrease, but the value of real estate doesn’t. But to confiscate wealth, the government must first ensure that this wealth doesn’t leave the country. This has been one element of the government’s drive to limit capital outflows. Over the past year, the government has imposed greater outflow restrictions on both individuals and corporations, especially when it comes to transactions that are unrelated to their core activities (primarily, again, real estate). The risk that comes with such controls is that the country could isolate itself economically from the rest of the world. It’s trying to avoid this by opening up its market to external investors through, for example, its bond exchange program. For now, however, only foreigners are allowed to invest in Chinese bonds through that program; Chinese investors are not allowed to invest in foreign bonds. Real estate in China is important because many state-owned enterprises sell their products, including steel, cement and so on, to construction companies. Many SOEs have become less profitable and cover their expenses with debt – with the approval of the central government. If they don’t, the government risks layoffs that could become politically challenging. As more of their income goes toward repaying debt, the government has begun taking steps to relieve this pressure with both debt-for-equity swaps – roughly $150 billion in debt-equity swaps were completed in 2017 as of August – and a new round of planned mergers between SOEs, with state support. It’s likely that these mergers will accomplish little. Merged companies usually benefit by cutting cost redundancies, but China doesn’t want this to happen. Ultimately, the government wants to keep employment high to prevent unrest, and it needs SOEs to help prevent unemployment. SOEs will therefore be limited in how much costs they can cut. The risk that China faces is an uncontrolled collapse in property prices; this would impact not only other real estate-related industries but also its financial system, which has become closely entwined with the real estate market. Furthermore, local governments, which often generate substantial tax revenue from land auctions, have become increasingly dependent on the property market. A collapse is more likely to occur if prices keep going up, hence the desire to deflate the market in a controlled manner and reduce the debt in the system. If borrowers and lenders continue to avoid abiding by regulations, the government will be unable to control the market. Fear over the state of the economy is driving borrowers to circumvent regulations in the first place. And this could undermine one of the government’s core objectives: to assert control over the wider economy. HERE is the deal. You can buy an entry in a computer ledger issued by a startup company on the basis of an unregulated prospectus. It is called an “initial coin offering” or ICO. But though the ledger entry is called a coin, you cannot spend it in any shop. And whereas the use of the term ICO makes it sound like an IPO (initial public offering), the process whereby a firm lists on a stockmarket, coin ownership does not necessarily get you equity in the company concerned. This sounds like the kind of bargain that would appeal only to people who reply to e-mails from Nigerian princes offering to transfer millions to their accounts. But ICOs may well be the most popular investment craze since the dotcom boom of 1999-2000; even Paris Hilton, a celebrity heiress, has jumped on the bandwagon. The list of active, upcoming and recent ICOs on the website “ICO alert” covers 31 pages of A4 paper and includes around 600 companies. More than $2bn has been raised in total. There is a serious side to the craze, just as there was with the dotcom boom. The technology that underpins digital currencies—the blockchain—is an important development. This is a secure, decentralised ledger that everyone can inspect but that no single user controls. It seems likely to be adapted for use across the financial system—to record property transactions, for example. Many ICOs are designed to finance applications that will make use of the blockchain—for trading currencies, lending money or searching for jobs. In some cases, the “coins” can be exchanged for services on the site. In a way, this is like selling air miles in a startup airline; investors can either use the miles for flights or hope they can trade them at a profit. For the business, it is also a way of creating demand for the product they are selling. But in plenty of cases, an ICO is just a way of raising capital without all the hassle of meeting regulatory requirements, or the burden of paying interest to a bank. Businesses are able to achieve this feat because investors hope that the coins will rise rapidly in value, as has been the case with bitcoin or ethereum, the best-known digital currencies, which have seen stellar gains in the past year. Nothing makes individuals more willing to take risks than the sight of other people getting rich. But bitcoin is also different from ICOs. Its appeal is as a digital currency that can be used in a broad range of transactions. And the supply of bitcoin is designed to be limited, meaning some people regard it as an electronic version of gold. So there is a chance that bitcoin or ethereum will come into widespread use, although their function as a means of exchange is undermined by the volatility of their prices. Currencies must be stores of value, at least in the short term. If you think a digital currency is going to rise by 20% tomorrow, you won’t want to swap it for goods and services; if you think it is going to fall by 20% you won’t want to accept it. It is also worth remembering that governments set the rules regarding the nature of legal tender within their borders. They will always have the whip-hand when it comes to issuing currency. If they believe that a digital currency is being used for widespread tax evasion, or is distorting the financial system, they will crack down hard. As far as business-related ICOs are concerned, a few may succeed. Investors may well be taking the “lottery ticket” approach, hoping that one big winner will offset a large number of losses. In a sense investors are acting like venture capitalists. But the sultans of Silicon Valley’s VC industry insist on a wide range of rights before they invest their capital, including protection against dilution of their stakes and (sometimes) the right to nominate board members. Investors in ICOs have nothing like that level of protection. In the circumstances, it is hardly surprising that regulators are getting involved. In America, the Securities and Exchange Commission has ruled that these coins may, in some cases, be securities and thus subject to regulation. A British regulator, the Financial Conduct Authority, this week warned investors about the risks involved. The Chinese authorities have gone a lot further, declaring that new ICOs are simply illegal. It is not easy to draw a line between financial innovation and reckless speculation. Perhaps an ICO will finance some breakthrough that boosts economic efficiency. If you work in the tech sector, you may be able to spot the occasional grain of wheat among the pile of chaff. Everyone else should assume that ICO stands for “It’s Completely Off-limits”.